The herkie, or side hurdler, is an extremely common intermediate level cheerleading jump that every cheerleader should learn to perfect. The following content will guide cheerleaders step by step on how to correctly perform a herkie, as learning proper technique is crucial for cheerleaders to safely perfect this skill. The overall execution of a herkie can be described as having the front leg extended straight in the air and the back leg bent backwards, as attempting to kick the bottom. Given the unique form and level of athleticism required for this particular cheerleading jump, it is imperative for cheerleaders to be flexible and maintain the ability to jump with power. Below, a video demonstrating how cheerleaders can utilize the Myosource Kinetic Bands to amplify their herkie is provided. With hard work, proper stretching and the addition of resistance training, cheerleaders will be able to execute this jump in just a short time with ease. Cheerleaders should thoroughly stretch before practicing and performing a herkie. Failing to stretch can easily cause a muscle strain or other types of injury. 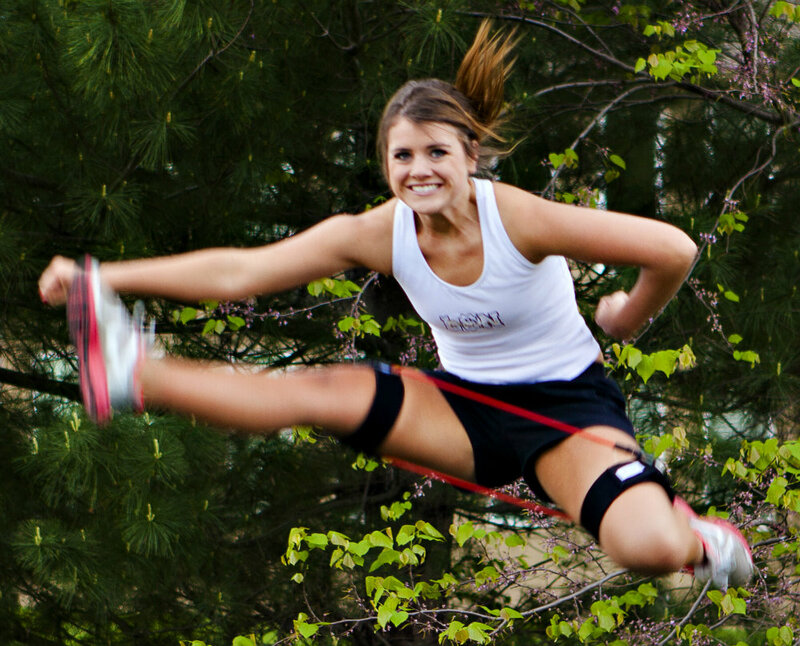 Cheerleaders can work on the flexibility and form of their herkie by mimicking the mid-air position of this skill on the ground, prior to attempting it as a jump. This “herkie stretch” can be achieved by sitting on the floor with the back straight and head up, followed by shifting the stronger and more flexible leg straight out in front of the body, as if in a straddle position while simultaneously shifting and placing the other leg to the side, bent at the knee with the foot turned outward (as if you are attempting to kick your booty). Gently reach for the toes of the outstretched leg, holding this position in a mild stretch for 30 seconds. Switch legs and repeat the same 30 second mild stretch. Cheerleaders will be stretching the stronger, more flexible leg out in front during their herkie, but it is important to practice the stretch for the other leg in order to improve overall flexibility and balance in the body. This ideal symmetry can be achieved over time if cheerleaders focus to make muscles feel "evenly" stretched each time. Cheerleaders should practice the execution of this jump in front of a mirror to visually see for themselves what needs to be corrected or tweaked in order to achieve a flawless herkie from the take off to landing. Cheerleaders who are dedicated to improving this skill can practice the herkie while wearing the Myosource Kinetic Bands to activate and strengthen targeted muscles, directly and drastically impacting the power and height cheerleaders can gain. The advantages cheerleaders can expect to reap from the addition of the resistance bands to practice and training will be discussed later in further detail, as we dive deeper into the science behind improving jumps and what drives faster results. 1. The cheerleader will begin by preparing the body through adequate stretching, gaining needed flexibility and aiding in the deterrence of injuries. 2. The cheerleader will initiate the execution of a herkie by standing upright, keeping chin up and shoulders back in a relaxed, pulled-back position with legs and feet together. 3. The cheerleader will begin with the arms in either a V motion or clasped together in front of the chest. Both positions are used to provide a strong arm swing for an increase in upward momentum. 4. The cheerleader will next swing the arms downward in a circular motion, crossing in front of the hips and thighs. As the arms are crossing, the knees should be bent in preparation for the jump. The arm swing is used to utilize the muscle power in the legs to jump off of the ground as high as possible. 5. As the arms are swung back in to the air, the cheerleader will use the built up momentum to do the jump. 6. The cheerleader will kick the leg of choice as high as possible, keeping it straight throughout the entire jump while simultaneously kicking up the back leg, bending it behind her at the knee. 7. The arm of the bent leg needs to be firmly placed on the same side hip, while the arm of the straight leg is in a high V motion. 8. The cheerleader will land softly, with the legs together and the knees slightly bent. Always remember that perfecting the landing completes the jump. Stronger legs, hips, and glutes are essential in order for cheerleaders to positively transform their herkie. The more power a cheerleader possesses to explode off the ground, the more height will be gained. Therefore, allowing more air time to show off the proper form and technique of their herkie. The Myosource Kinetic Bands wrap around the legs, just above the knees, giving cheerleaders the opportunity to train hands free while continuing to get an extreme workout for quick and safe results. Below, a video is provided to demonstrate how the bands can be utilized by cheerleaders to target and strengthen the important muscles for powerful take offs and stable landings. In this video, Ashley is using the resistance bands to improve her herkie. Just like all cheerleaders, she wants her jumps to be higher with increased flexibility for proper form in the air. She is taking advantage of the Myosource Kinetic Bands to achieve that goal. During the resisted set, the resistance bands are used to build strength in the legs, hips, and glutes, which are essential for a higher, more powerful herkie. The unresisted set is to be done immediately after the resisted set. During the unresisted set, the cheerleader’s legs will feel much lighter, which with time and practice will increase the height and power of the herkie. Check out the cheerleading page on our website and get your resistance training started today with our Cheerleading Combo. Maximize the benefits of your cheerleading workouts by adding the Myosource Kinetic Bands to your training routine. Cheerleaders around the world are seeing the benefits of resistance bands training for their jumps and other sport-related skills.